with food, material assistance, shelter, and emotional and spiritual care for survivors. As severe weather intensifies across the country, insured losses continue to increase exponentially, totaling billions of dollars each year. Here in Des Moines, many of us will struggle to recover from the catastrophic effects of tornadoes, hailstorms, flooding, drought and blizzards during our lifetime. When The Salvation Army responds to a disaster, our first aim is to meet the basic needs of both survivors and first responders. In addition to providing food and material assistance, we also offer a ministry of presence, coming alongside those who are suffering and grieving by offering emotional support and physical comfort, as well as prayer and spiritual counseling when it is desired. If a disaster strikes your community, you can be sure that we will be among the first at the scene, doing everything possible to bring comfort and hope. Often the most pressing need at the scene of a disaster is food and water for survivors and first responders. Food may be prepared and served at a nearby Salvation Army worship or service center or on location via one of our mobile kitchens. We also provide beverages that hydrate, replenish electrolytes and sustain energy. You've likely seen images in the media of survivors standing shocked next to the wreckage that was once their home. In their time of greatest need, we provide clean, safe shelter in our worship and service centers, as well as in local churches, schools and other temporary facilities. Disaster survivors can rest and be cared for as they figure out their next steps. It's not unusual for survivors to emerge from a catastrophe with little but the clothes on their backs. We provide for the basic physical needs of people who have lost virtually everything, from clothing and personal hygiene items to household goods. We also assist with the daunting task of cleanup and long-term restoration by distributing supplies, coordinating volunteer rebuilding teams and establishing warehouses to distribute reconstruction supplies, often being the last volunteers to leave a disaster area. Disaster relief and recovery services are provided to all in need, but for those who request it, our counselors, many of whom are ordained as clergy, also share the Word of God, prayer and spiritual counseling as a source of solace and hope. We also know that it's important to simply come alongside and be present with those who are suffering and grieving. Sometimes a quiet gesture of love and compassion can make all the difference, even in the direst circumstances. You can help disaster recovery efforts. Survivors of natural disasters like tornados and floods often emerge with just the clothes on their backs. 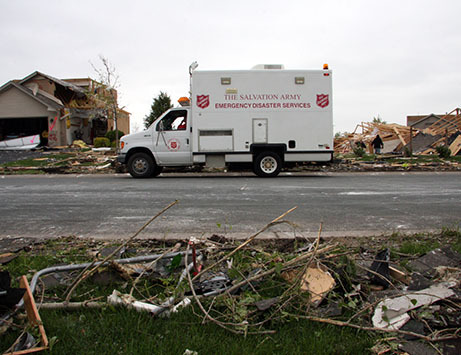 A donation to The Salvation Army supports disaster survivors not only with food and water, but also with emergency housing, material assistance, cleanup and restoration. Spiritual and emotional support are an important but often overlooked component of disaster recovery. 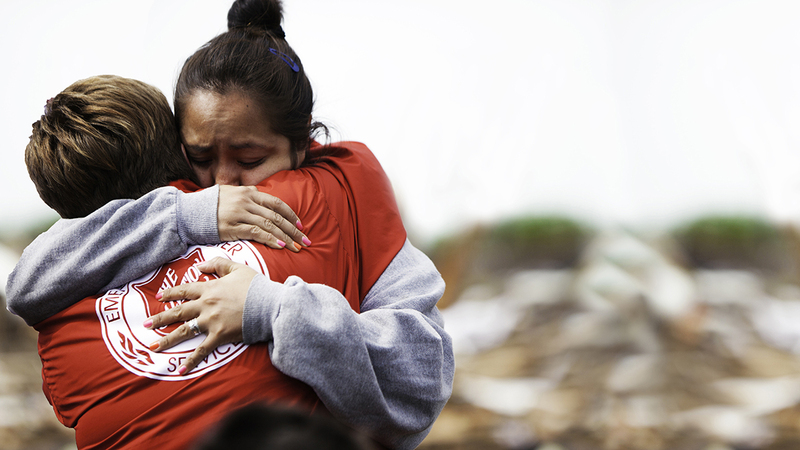 A donation to The Salvation Army supports the counselors and clergy who come alongside those who are suffering or grieving in the aftermath of a disaster.